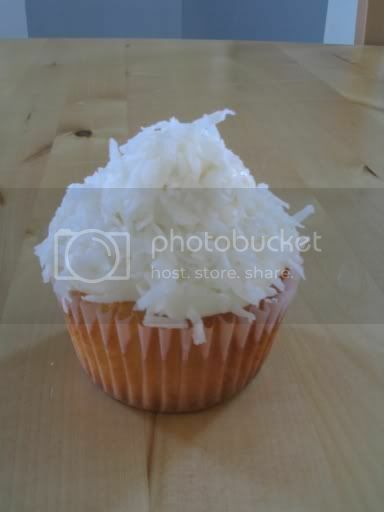 These cupcakes were the absolute moistest cupcakes I have ever had in my life! 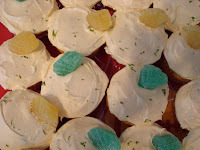 I had heard about Margarita cupcakes before, but had never tried or had one. And now I'm kicking myself for wasting so many years of my life without these cupcakes! I'll admit that I was a little shocked they came out so good, because when I tasted the batter I was a little skepitcal...they were VERY strong thanks to the 1/2 cup of tequila and the few splashes of Grand Marnier that I added. But when my fluffy, bright yellow cupcakes came outta the oven, I grabbed on, peeling off the wrapper immediately and took a bit (hey if they weren't good, I wasn't gonna serve them to all my friends who think I'm a baking God :0) ) One big bite of my cupcake and a sign of relief came from my overstuffed mouth that was gorging on an outrageously good cupcake! I think the package of pudding also helped to moisten these babies up, and I am now excited to try a variety of cupcake mixes with puddings...something I had never thought of before. ...All right now, raise your cupcake high and make a toast!! 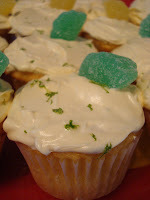 For the frosting I used a store bought white buttercream frosting, added a squirt of lime juice and some lime zest. Combine cake mix, pudding mix, vegetable oil, limeade, water, eggs, tequila and Grand Marnierin a large mixing bowl. Pour batter in prepared cupcake pan. Bake for 18-20 minutes or until inserted toothpick in the center comes out clean. Yum! These must have been a hit a the party. I love fixing up cake mixes too. I love your website! I'm a dessert fanatic too! I'm know as the "cookie monster!" Your cupcakes look so delicious! I want one! 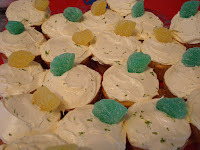 Cupcakes with tequila. What a beautiful marriage. I'm unfortunately well over 21, so I can have a ton of them. I have nominated you for E for excellent award! Congratulations and please visit my blog on this url - many thanks.